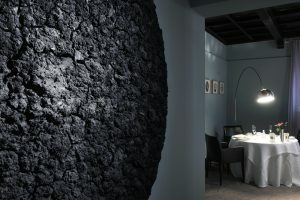 There are certain accomplishments that I view as major milestones of my Italy expatriation: opening my Partita IVA, signing a 4+4 contract for my apartment, obtaining my certificate of residency and the day that Osteria Francescana became a reality instead of an unfulfilled promise from a former paramour. Osteria Francescana, chef Massimo Bottura’s three-star Michelin-rated shrine, has been at the top of my list since I touched down in il bel paese three-and-a-half years ago, so when an American pal dropped in with a coveted reservation at the world’s best restaurant in tow, I naturally took him up on the invitation to be his plus one. After averting a near crisis due to a canceled train (there was a regional strike), we step outside Modena train station and right smack into a stifling blanket of heat and humidity so pervasive that I could practically hear my freshly blown out tresses start to frizz. A dizzying taxi ride through the city’s narrow, compact roads and summer-fruit-hued buildings ends at Via Stella 22, a nondescript three-story watermelon-pink palazzo on a quintessentially Italian cobblestoned street. 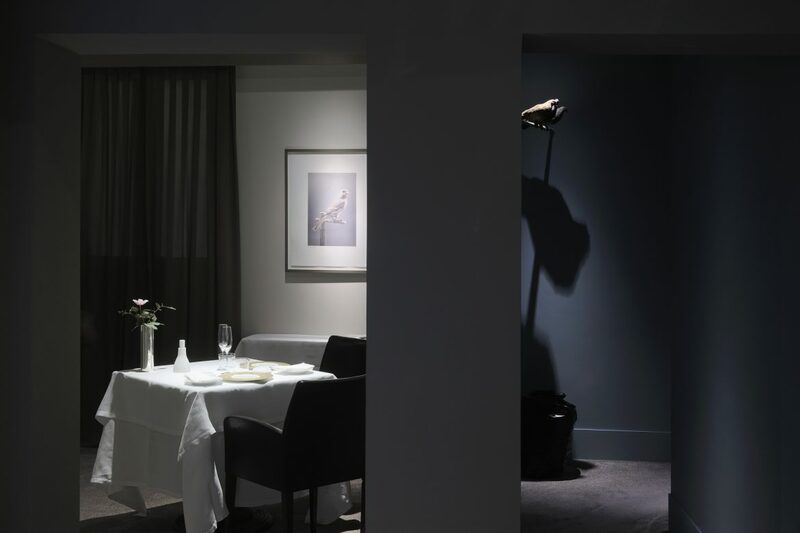 Save the Italian flag displaying “#1” suspended above the doorway in honor of the Osteria Francescana’s recent distinction as World’s Best Restaurant, one might just mosey on by this food pilgrim’s mecca without giving it a second thought. We ring the doorbell and a friendly, three-piece suit-clad woman greets us, inviting us into the carpeted foyer where Duane Hanson’s life-sized security guard wax sculpture lurked in the corner. He looks so real, I almost buongiorno him. 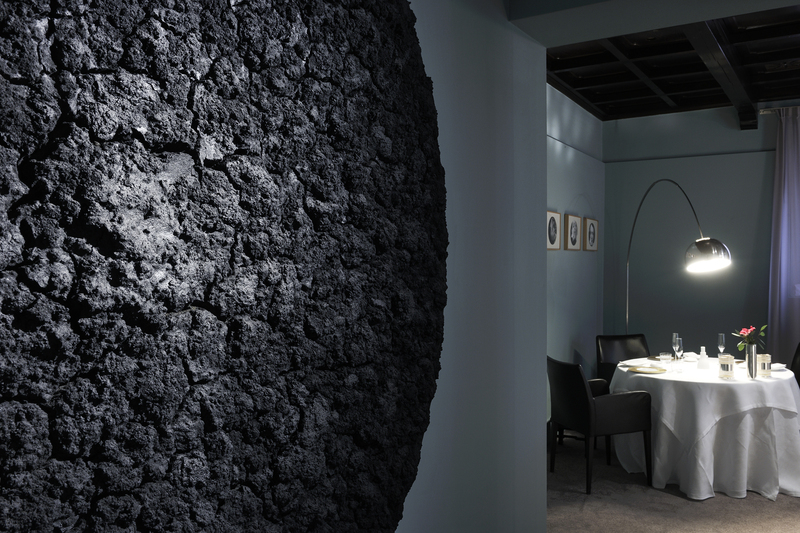 As famous for its art as it is for its food, Osteria Francescana dubs as an exhibition space for the chef’s extensive contemporary art collection. 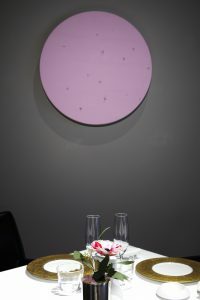 Maurizio Cattelan’s pigeons gaze down at us as we are led to our place in a three-table room adorned with one of Damian Hirst’s Spin Plates. 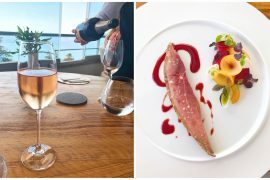 The menu items read like a list of Roald Dahl’s short story titles and we decide on the Tradition in Evolution tasting menu. As I place my napkin on my lap, I have no idea that I am about to embark on a sentimental trip down memory lane. 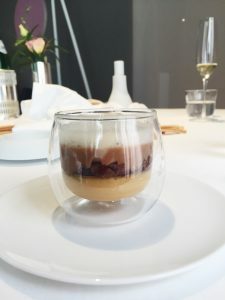 Three small bites welcome us, all traditional Italian flavors in surprising shapes and sizes, a prelude for our forthcoming repast. Rabbit cacciatore macaroons are presented alongside thin, crispy, Parmesan wafers, a twist on traditional Modenese lard crepes called borlenghi. 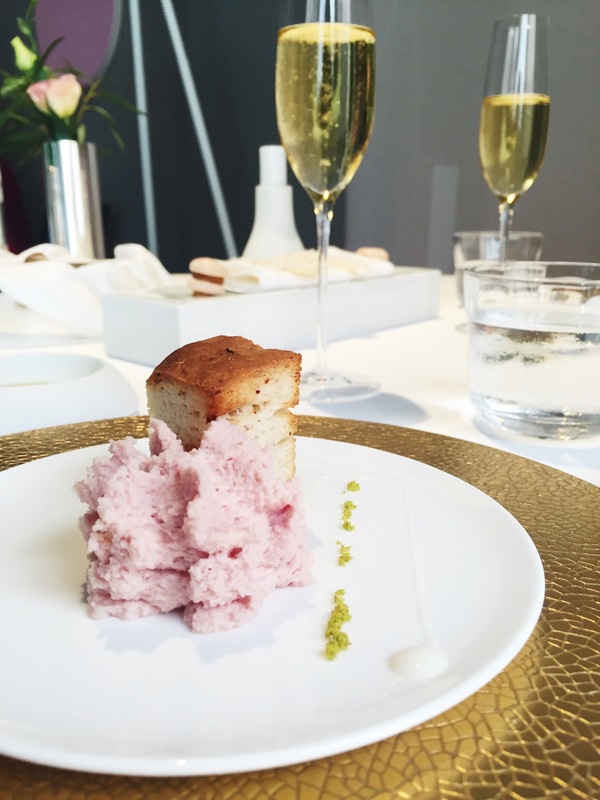 “A Memory of Mortadella” comprises an elegant dollop of creamy mortadella mousse accompanied by garlic and pistachio as well as a piece of gnocco modenese, a lard-flavored flatbread for dipping. My childhood cold cut of choice was baloney, and the first bite brought back the foil-wrapped-sandwiches my parents packed with love inside my Jem and the Holograms lunch box. 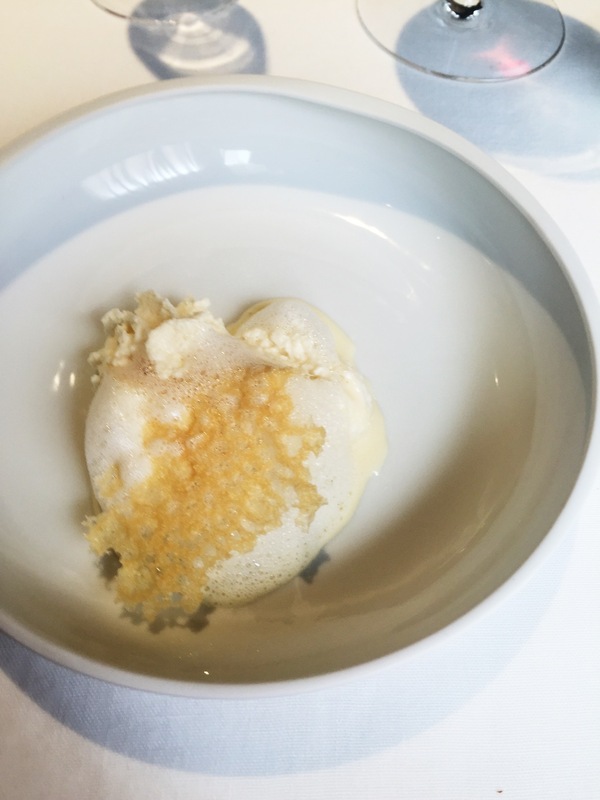 However, Bottura’s gnocco modenese sure put Wonder Bread to shame. 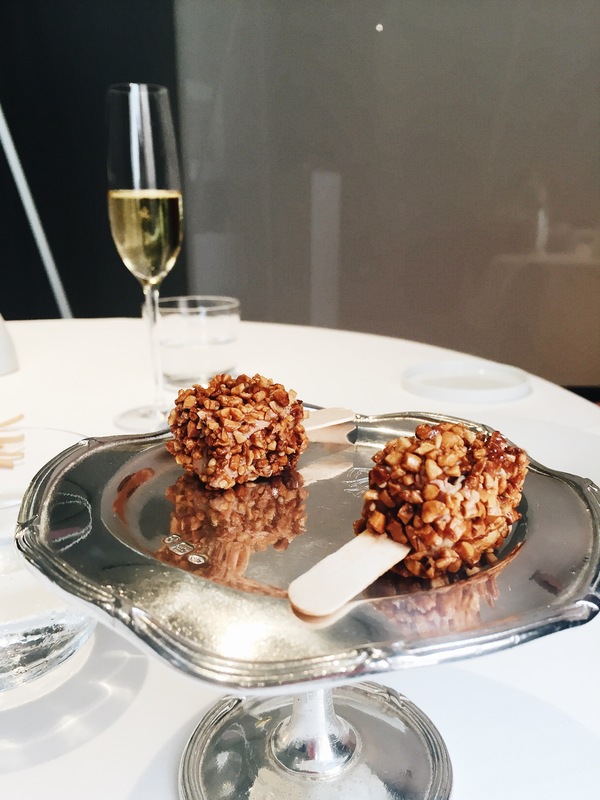 Foie gras ice cream bars with a magnum exterior contain a balsamic vinegar center covered with Noto almond and Piedmont hazelnut croccantino that added just the right amount of sweetness and crunch against the rich foie flavor. While there is no comparing Good Humor with Osteria Francescana, I can’t help but remember the thrill I felt at the chime of the Ice Cream truck as it meant that a Toasted Almond bar was imminent. Pasta fagioli, one of my all-time favorite comfort foods, presents Bottura’s personal gastronomic history into three layers, “A Compression of Pasta and Beans.” The foie gras custard creme royale bottom paid tribute to his time with Alain Ducasse while the air of rosemary on top is a nod to the chef’s summer at el Bulli. The center: an interpretation of a classic pasta and beans preparation, an homage to his grandmother. However, thinly cut shards of Parmesan crust replaced the pasta. “The Eel swimming up the Po River” tells the story of an eel that followed the Este family, who ruled Ferrera for centuries but were forced out in 1598 due to no male heir. The elegant, saba-lacquered eel, a metaphor for Bottura’s career, swam against the current to surface on my plate with a dash of velvety polenta cream from Veneto and tart Campanine apple gel from Mantua that he acquired on his journey. 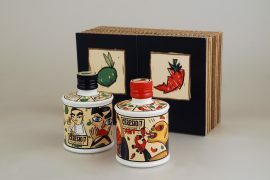 Italian upbringing or not, everyone has tasted Parmesan cheese at some point during their childhood. For many Americans, it’s the ubiquitous pre-packaged grated, sadly mass-produced form. 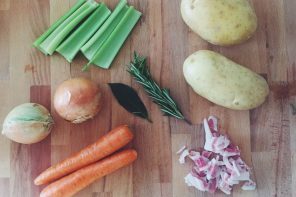 Before I knew anything about food, I knew enough to know that I didn’t like that kind of “parmesan” and didn’t want it anywhere near my pasta. Authentic Parmesan is complex and pronounced, and serves purposes that surpass a pasta sprinkling. “Five Different Ages of Parmesan” celebrates the local cheese in all its glory, showcasing five different ages in five different textures: 24-month parmesan demi-soufflé, 36-month parmesan cream sauce, 40-month parmesan in a crispy galette, 30-month parmesan foam and an “air” made from 40-and 50-month parmesan crusts. These five shades of white come together in one melodious mouthful after another. Red-sauce Southern Italian style lasagna headlined many Sunday suppers of my childhood, yet the Emilia-Romagna version is with ragu and béchamel. Lasagna Modenese or not, the crispy corner piece was always the best. Instead of preparing an entire pan with just a mere lucky few landing a coveted corner, Bottura’s “The Crunchy Part of the Lasagna” ensured that everyone savored the best bite. 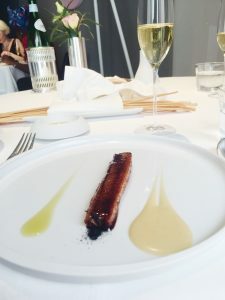 A bed of old-school style ragu (slow-cooked large pieces of gelatinous meat like beef cheek, tongue, tail and shoulder with bone marrow, which are then chopped by hand) was topped with a tricolor dehydrated pasta sheet in the shades of the Italian flag. 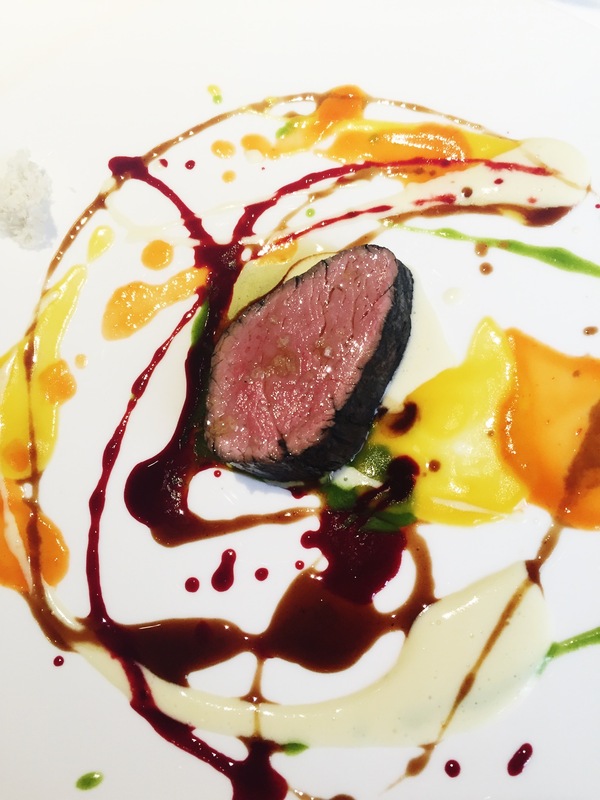 “Beautiful, psychedelic, spin-painted veal, not flame grilled” is inspired by the Damian Hirst work overlooking the dining room. A milk-marinated beef filet sits amid intricate squiggles of scarlet red pepper sauce, dandelion-hued yellow pepper sauce, forest green chlorophyll reduction and ivory potato puree. I swoosh each bite of meat through the sauces smudging the colors into what eventually resembled something more along the lines of a Gary Simmons chalk art piece. 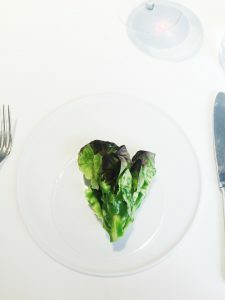 The savory courses conclude with “Caesar Salad in Emilia”, a verdant Salanova lettuce heart inside filled with 22 ingredients that can change on any given day, but usually include anchovies, parmesan crisps, egg yolk and pancetta. The grand finale couldn’t have been more perfect as lemon has been my flavor of choice since childhood. 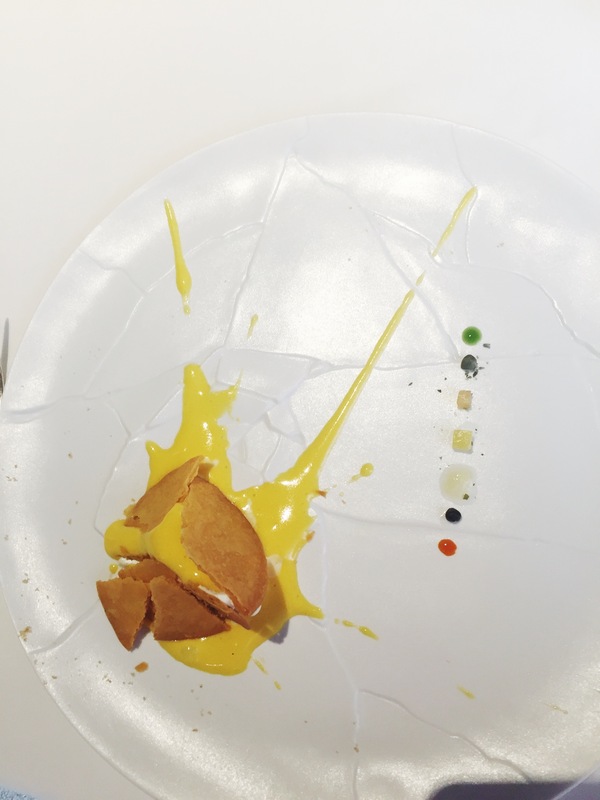 “Oops I dropped the lemon tart!” was born from the pastry chef’s serendipitous slip of the hand, prompting Bottura to serve the tart fragmented ever since. A vertical row of seven colorful dots on the right of the plate resembles a Damien Hirst Spot Painting and encompass the flavors of Southern Italy: lemongrass gelato, lemon zabaglione, candied and savory capers, hot pepper oil, oregano, lemon powder and candied bergamot. Lunch couldn’t have ended on a higher note. 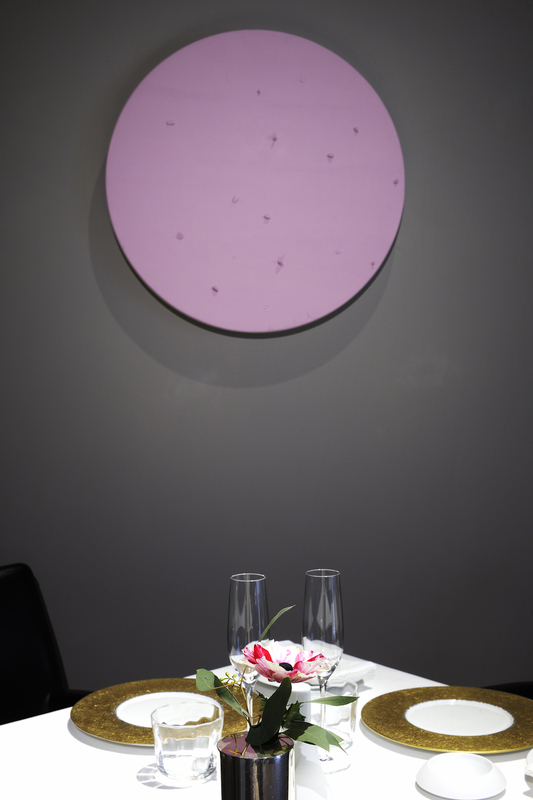 Osteria Francescana’s beauty lies in how Bottura’s stories come alive on the plate, letting guests see, smell, eat, process, interpret, filter, re-interpret and share their experiences, kind of like the game telephone. 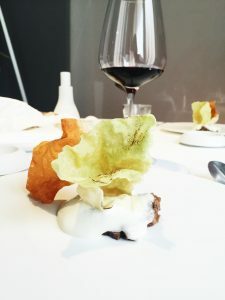 My memories and life experiences differ immensely from Bottura’s, yet poignant experiences from my childhood stood front and center during lunch, stirring memories that have been buried for years, even decades. 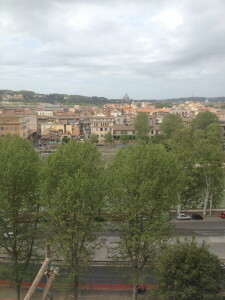 Different things—be it food, art, history– have different meanings to different people. 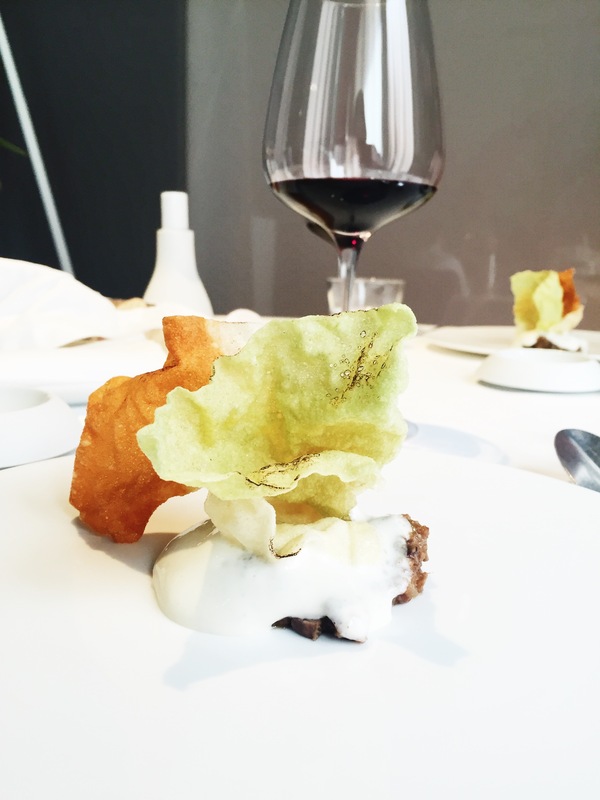 I have never seen this so evident on the plate anywhere than at Osteria Francescana. The meal, while the same, is different for everyone. I recall going for lemon Italian ices with my dad at Café Trento in the summer while perhaps the lady at the next table recalled the fresh capers in her grandmother’s backyard. Who knows? That’s the beauty of the experience.